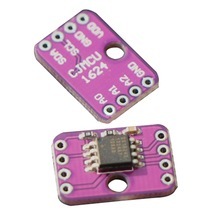 The direct-to-digital temperature sensor allows the DS1624 to measure the ambient temperature and report the temperature in a 12-bit word with 0.0625°C resolution. The temperature sensor and its related registers are accessed through the 2-wire serial interface. Figure 1 in the full data sheet shows a block diagram of the DS1624.